Up, down, up, down; 200 points higher, 300 points lower; rinse and repeat! "Mr. Market is kind of a drunken psycho. Some days he gets very enthused. Some days he gets very depressed. And when he gets really enthused... you sell to him, and if he gets depressed, you buy from him. There's no moral taint attached to that." How low is indicative of a bottom? At what exact price level is the immediate trend confirmed -- or canceled out? Now, if you can answer all three questions, then we're actually getting somewhere. If you have these answers, your chances of taming the drunken psycho -- rather than be tormented by it -- are greatly increased. 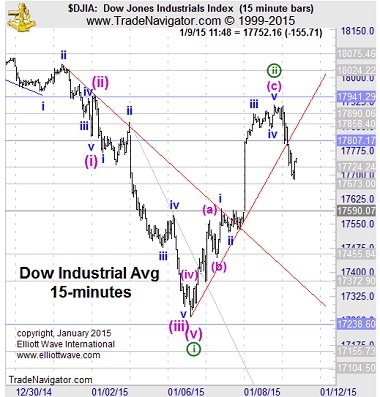 Enter Elliott wave analysis and the last two, tumultuous weeks in the Dow Jones Industrial Average. 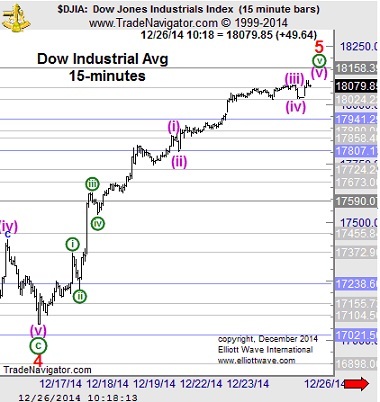 Let's take it from the top, at the Dow's December 26 high of 18,103. "Wave v (circled) up has extended but can be counted as ending. With the series of higher lows and higher highs, we'll need to see a break of the pattern to make a good case for a top. Tuesday's late low at 18028 will have to give way to argue that a sizable decline has begun. " "Staying under the 17,372 keeps the pressure down and pointed at 17,238." "No trade should occur appreciably beyond 17,590 if the grey wave (iv) potential is to be realized. Beyond 17,590 would be much more clearly circled wave ii in progress, which could be hunting for Monday's gap just above 17,807. Make the Dow commit to one of these counts before getting involved." 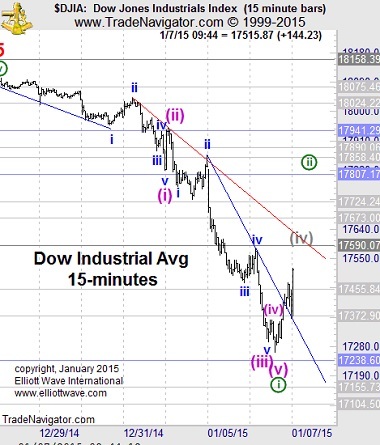 January 8 Intraday Stocks Specialty Service: "Nearly up to the 17,807 subdivide cited yesterday as the probable minimum for circled wave ii action. Yet the Dow is likely not finished." This is a great example of Elliott wave analysis in action -- but let's be honest here. There's no quick fix strategy for taming the drunken psycho of financial markets. If "buying high and selling low" was simple, we'd all be Warren Buffetts. But Elliott wave analysis does give you an objective method for identifying high-probability trade set-ups, and minimizing your potential for loss along the way. Plus, the 6-page, chart-filled report also includes a bonus lesson on how to calculate protective stops. The best part is, the entire report is 100% free to our Club EWI members -- a community that now has grown to more than 325,000 members. Get instant access to this eye-opening report, considered required reading by all Elliott enthusiasts, today!